This week (21/11/2017), the Centre had the pleasure of welcoming our very own Cynthia Thickpenny (University of Glasgow). Cynthia, who is in the final stages of her PhD, presented on key pattern within insular art. Based off of her research’s findings, Cynthia produced a fantastic paper which promises much for her upcoming thesis. Key pattern, as Cynthia informed us, is an abstract art which consists of straight lines and rectangles. Intersecting straight lines are arranged parallel and perpendicular to each other in order to produce a beautiful geometric pattern. Key pattern uses negative space (the space around and between the subject(s) of an image) to produce a never-ending pathway which can be traced throughout the finished piece. The overall lattice then consists of single spiral structures which are generally similar in size (unlike those found in Spiral Pattern). Despite key pattern’s prevalence within insular art, it is still poorly understood. Cynthia’s PhD aims to address the misconceptions and misunderstandings which still haunt key pattern today. To do so, Cynthia has adopted a new approach which focuses on analysing the properties of key pattern – its structural elements and structural principles. This is not a study of key pattern’s context or symbolism, but rather a study of the artists who produced it. These artworks, in the words of Cynthia, present us with ‘a window into medieval artist’s intentions’. 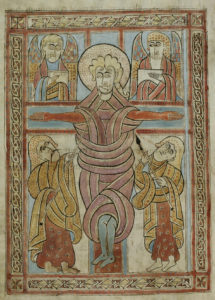 The crucifixion page from the St Gall Gospel Book (c.8th Century). Notice the key pattern around the border of the image. 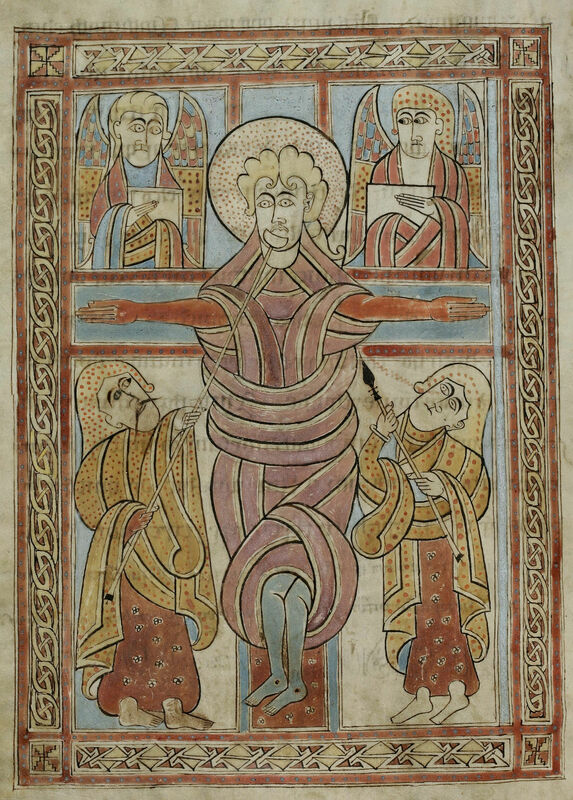 During her presentation, Cynthia put her theory into practice, by providing new evaluations of four case studies of key pattern (these being the St Gall Gospel Book, the Rosemarkie Panel, the Harley Golden Gospels, and the Kilmartin Cross). Perhaps the most fascinating finding from Cynthia’s work is the fact that she has uncovered mistakes within a number of these works (most notably the Rosemarkie Panel). By measuring every line on the panel, Cynthia was able to identify the point at which the artist realised that he/she was about to run out of room, and so they made adjustments in order to fit the piece onto the panel. This is a lovely example of how this study is achieving its goals of humanising these pieces of art, and does an incredible job of bringing thesepieces to life. The Rosemarkie Panel with key pattern at Groam House Museum. In her conclusions, Cynthia pondered why, unlike the Romans, Greeks or Chinese, key pattern remained central to insular artists for so long. In fact, the only other place in the world where this is also the case is within Ancient Puebloan culture, in what is now the American Southwest. The reason for this is still a mystery, however if this paper is anything to go on, there is little doubt that Cynthia’s thesis will go some way to explain why this is the case! If you want to find out more on Cynthia’s research, check out her research page: https://www.gla.ac.uk/schools/humanities/research/students/cynthiarosethickpenny. Next Tuesday (28th Nov) the distinguished Gaelic scholar, Ronnie Black visits us to discuss how the Reformation changed the Gaelic world. Join us in the Alexander Stone Building at 5.30pm.